When we fight, we do it like we mean it. 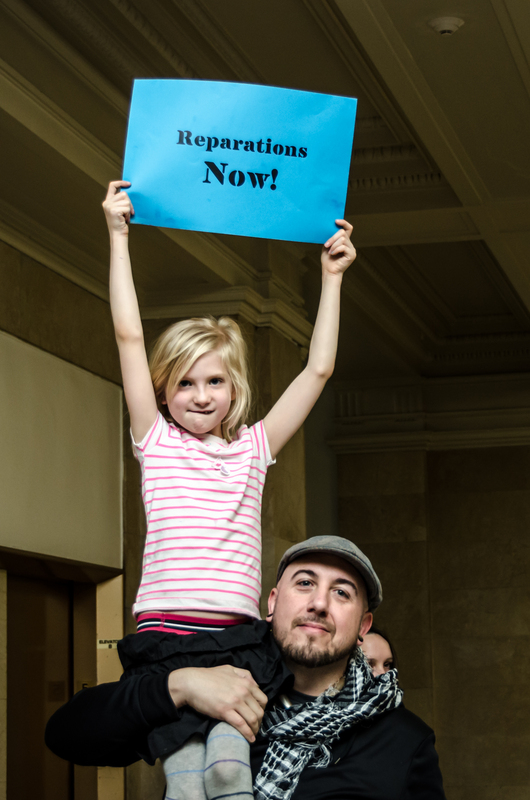 And that’s what we’ve been doing in Chicago in recent months, as we’ve fought to pass the reparations ordinance for CPD torture survivors. 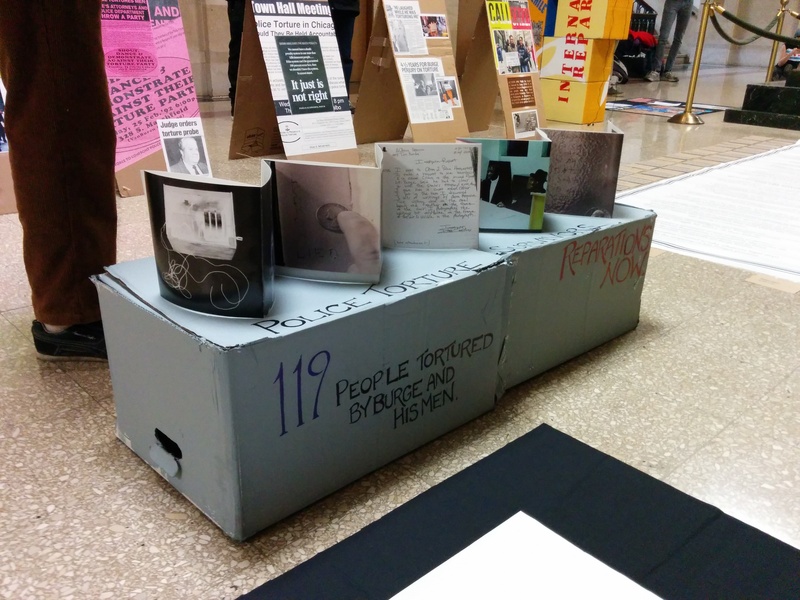 The effort to win financial compensation, free education, and mental healthcare for torture survivors found it’s way to City Hall again on Wednesday, as we staged a pop up art exhibit outside the mayor’s office. 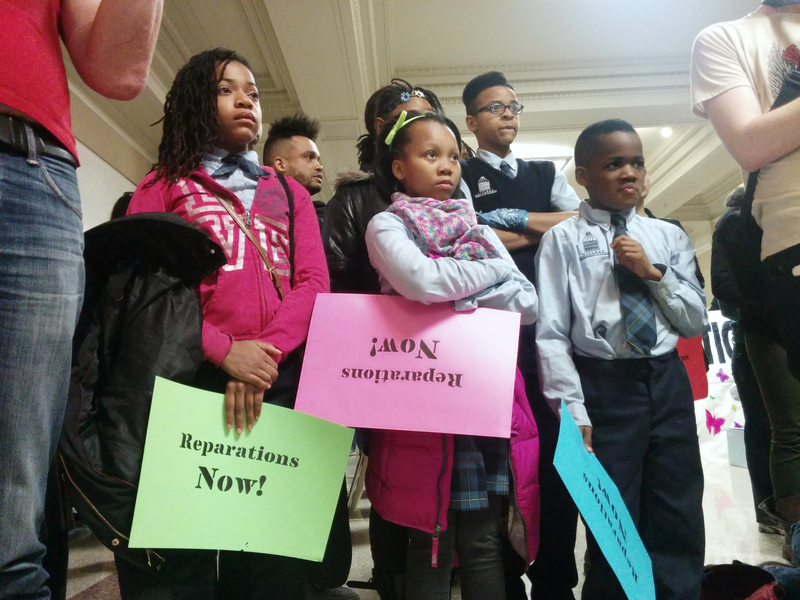 One aspect of the ordinance that community members have rallied around is its demand that the true history of former police Commander Jon Burge and his “midnight crew” be written into the Chicago Public School curriculum. The ordinance would also require the city to in some way memorialize the experiences of those who lived through Burge’s reign of torture at Area Two. It was these provisions that inspired the organizers of this event to build an art exhibition on the fifth floor of City Hall, just outside the mayor’s office, honoring the struggle of the survivors and their allies, and calling upon the mayor to take action. The exhibition, of course, had no official permission. We planned the day for weeks, working under the assumption that we would successfully get our supplies inside, set up the display, and hold the space all day. When the event was conceived of, a more confrontational tone had been discussed, as we were very pointedly demanding a finance hearing, so that the ordinance would no longer languish in the committee stage. But our plans shifted somewhat on Monday when we heard some unexpected and welcome news: we would get our hearing. 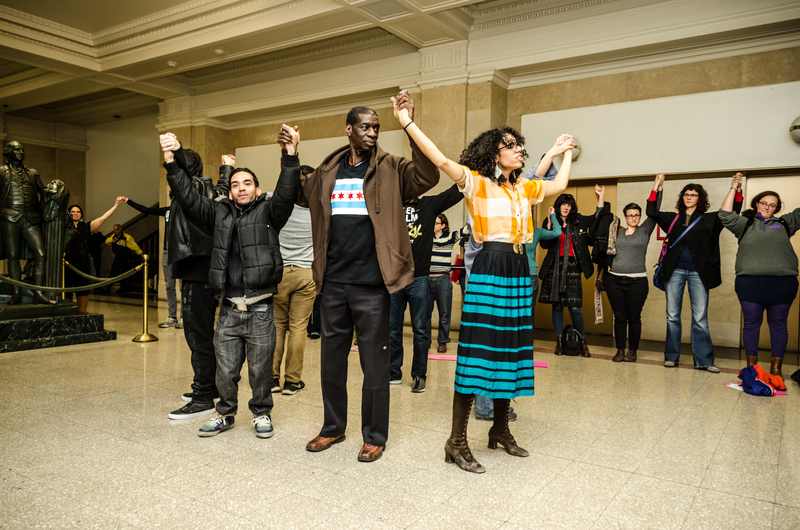 While we know the campaign will still have tense moments, and may require various stages of escalation before its end, we felt it was important for Wednesday to not simply be an act of protest, but also a learning opportunity and celebration of just how far the movements against police abuse and torture have come in Chicago. 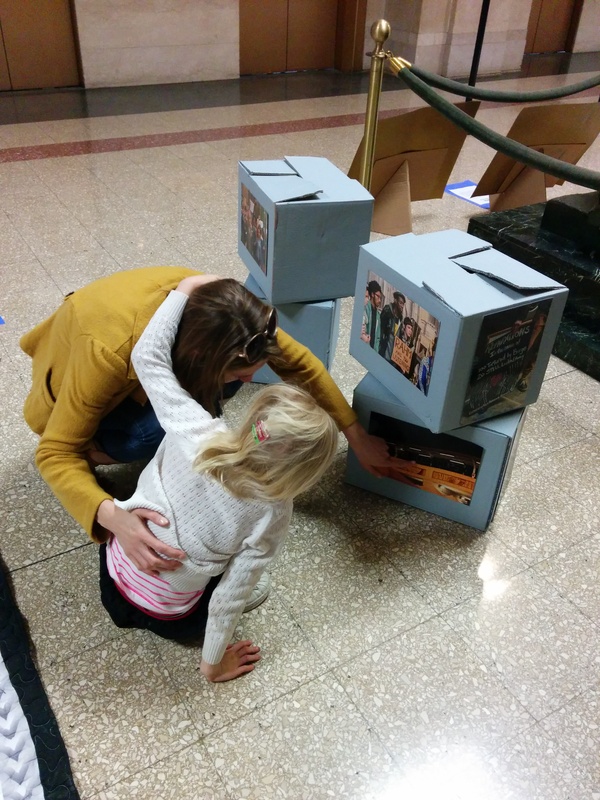 So we headed into City Hall at 10am Wednesday morning, and after some minor difficulties with the police, we managed to successfully set up our exhibit. 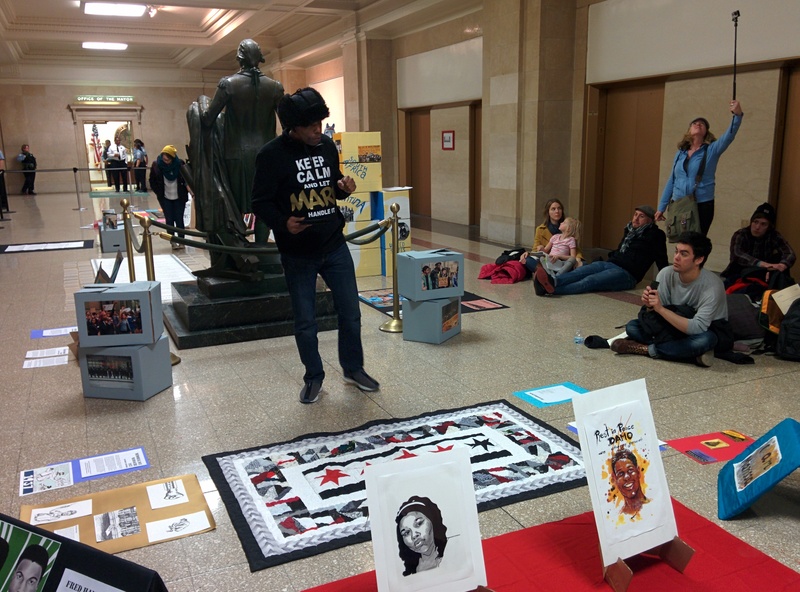 Throughout the day, people came through to see the work of local artists like Cairá Lee Conner, Monica Trinidad and Sarah Jane Rhee, and to attend teach-ins led by torture survivors Mark Clements and Darrell Cannon, and people like Sali Vickie Casanova, who have spent years fighting alongside them. We also heard from people like Page May, who has been involved in both the fight for reparations, and the broader struggle against police brutality. At 4pm, we rallied with community members who had joined us to close the event. It was a beautiful way to mark where we stand in this fight, and to lift up the work of those who’ve gotten us here, but it was also a moment that reminded the community that this crucial fight will likely only intensify in the weeks to come. As we close in on a potential victory, we are staring down inevitable challenges to the ideas behind this transformative effort, and efforts to chip away at the things that make it so valuable to those of us who want both accountability and change. After the event, I headed home, but I spent most of the night unable to sleep. This isn’t a unique phenomenon for me, but it was an especially rough night. Sometimes, at the exact moment that my body is screaming that it needs to slow down, my mind starts moving a mile a minute. This is what anxiety looks like in my world – a fast paced blur of all the ways we could move forward, and all the ways we could fall short. I feel strongly that we will win, but I must admit, it’s all very daunting at times. 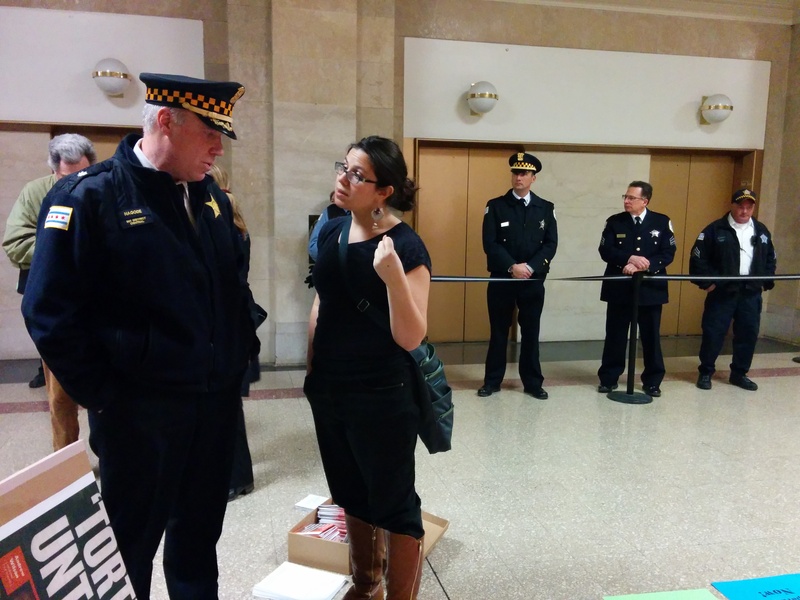 When I spoke Wednesday, I said that Chicago was both a battleground and a training ground. As an action oriented organizer who has both skills to share, and so much yet to learn, I stretch myself pretty thin. Like many of us, I often find myself running from one front of struggle to another, providing what assistance I can, and always wondering if I am doing enough. I have hope, and that helps. I have seen the love, creativity, and power of our communities manifest itself in the streets as we have shown up to push back against police violence. I have seen us put aside differences for the sake of common cause, if not common belief. I have seen it, so I know we are capable of doing whatever must be done in this fight, and in others. But I know I am not the only one who sometimes feels the wear and tear of caring about something that’s steeped in so much pain and need, and propelled by so many hopes that have long deserved realization. Yes, it’s an ordinance, and I don’t think its passage is somehow going to free us all, but the idea of carving an actual reckoning for police torture into this city’s laws; the idea of making this system answerable, on our terms, and building the truth of its violence into our local culture, is so hopeful. And in the darkest hours of our darkest days, our hope, our relationships, and knowing how far we’ve come – these are the things that carry us. Today, I went to Curie Metro High School to join a conversation with some young people about criminalization. I was grateful that the National Director of BYP 100, Charlene Carruthers, was also in attendance, because, like local organizers Mariame Kaba and Page May, Charlene is a woman of color whose company makes those around her stronger and sharper. Hearing the things I believe in said in her voice made the day feel a little less heavy, and my heart feel a little less tired. After the talk was over, I wasn’t sure how many young people it really registered with. Their teacher insisted they had been very interested, but I wasn’t sure. Then a young woman came up to me as I was putting on my coat. She told me that what I said about how this system had disarmed our imaginations, and convinced us that we couldn’t do any better, really meant something to her. She said that she believed what I said, about needing to dream beyond the boundaries created by the state. These aren’t my ideas, of course. I was taught to dream beyond this moment by powerful women of color, and I hope that my moments of realization were as heartening to them as my brief conversation with this young woman was for me. In that moment, I was reminded: we are winning, we are rising, and we are strong. But most importantly, we are dreaming ahead of where we are, and fueling our fight with hope and the knowledge that the world we want is possible, if we fight like we mean it. I was much moved by this account – the detail it gave of this exciting event, and even more exciting unexpected conclusion, is so full of hope and belief, and also the toll it takes on those who are in the middle of this splendid work, helps me go on my way today smiling and inspired.